A big C15 aisled church with a vaulted tower. It has contemporary wall paintings and an incised stone tomb-slab. All Saints stands east of the castle hill and reconstruction after the raid of 1377, probably on the previous site, was leisurely, for a will of 1436 speaks of it as ‘new’ (VCH 9 p21) and it does not follow that it was finished even then. Built of local stone, some of it greensand, it forms a single whole. Re-used stones, some carved with chevrons, suggest its predecessor contained C12 work. In the early C19 the south porch is said to have had a rounded arch (Horsfield I p252), but it can hardly have survived from this earlier church, though some foundations of uncertain purpose and date found nearby (VCH ibid) might have. The nave arcades of the present church confirm that the rebuilding was mainly in the early C15, for the heads of two moulded orders spring from upward extensions of the octagonal piers, a device more common in the C14. The aisle windows are renewed, but the Sharpe Collection drawing (1797) shows similar openings and the complete original east window in the north aisle shows the tracery is accurate. The rood-stair at the east end of the south aisle is contained in what looks like a big buttress. There is space for a clerestory but no windows and though there is flint and stone chequerwork decoration on the south side, the roof on the north side in 1797 was continuous, so this may not be original. Only the north aisle retains some old roof timbers. 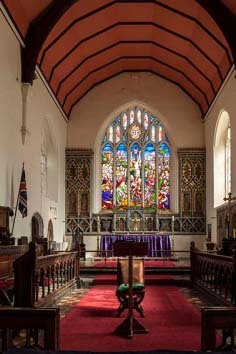 The chancel, like the nave, has three-light side windows with panelled tracery. The chancel arch has thin abaci, chamfered responds and a head of two wave mouldings. All north windows except one are concealed by C19 vestries, entered by an original four-centred doorway that formerly led to the outside. The five-light C19 east window differs from the three-light one in the Sharpe drawing, which was not original as it had wooden mullions. The tower was almost certainly built last, possibly as an afterthought or at least after a gap, for its north and south walls incorporate large buttresses belonging to the west end of the nave. Despite much restoration, it is massively handsome with a north east stair turret, a four-light west window with a castellated transom and a doorway with shields in the spandrels. Window and doorway are contained in a single arch, separated by a quatrefoil-frieze. The tower arch has a head of two moulded orders and in the tower space is a star-vault (cf St Clement), springing from grotesque corbels. The large central opening, surrounded by the signs of the zodiac, allowed the bells to be hoisted up. The two-light windows with ogee heads and finials of the second stage are doubtfully C15 and may be C19, but cannot be seen on the Sharpe drawing. Beneath them to north and south are big flintwork crosses. The third stage has chequered battlements above carved grotesques that include what looks like a cat, a tiled cap and square, uncusped bell-openings divided by transoms, which look later C15. 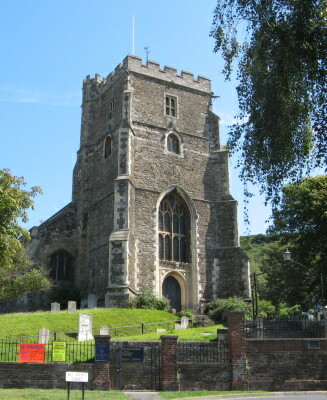 Changes to town churches after the Reformation were frequent, particularly in prosperous times, as the C18 was in Hastings. The Sharpe drawing shows most north windows had been altered from their original condition by 1797 and Nibbs’s engraving (1851) confirms that the rest had been treated similarly. The south porch noted by Horsfield probably dated from this period, though a C15 predecessor in so large a church is likely. The Sharpe drawing also shows a dormer at the north west corner of the nave, which would have lit a gallery. Restoration started in the chancel, though no date is known, though in 1868 Sir Stephen Glynne (SNQ 16 (May 1966) p237) noted its windows had been restored and the roof is probably contemporary. 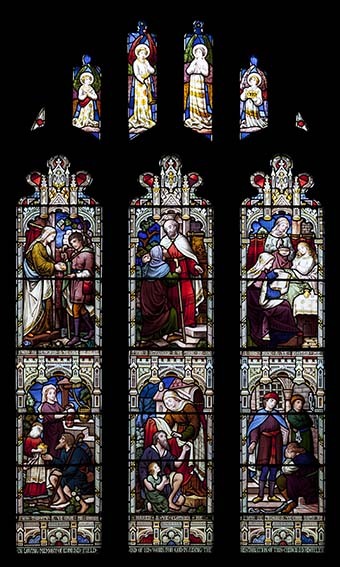 The presence of C A Gibbs‘s glass of 1865 in the east window (see below) probably provides an approximate date and it is conceivable that W Butterfield did this earlier work, though of the Gibbs family it was A Gibbs with whom he usually worked. Butterfield certainly undertook the rest in 1869-70 (B 27 p421). In 1869 his work was already controversial and in reviewing his work here The Architect (1 p158) hoped he would not introduce any painted decoration. 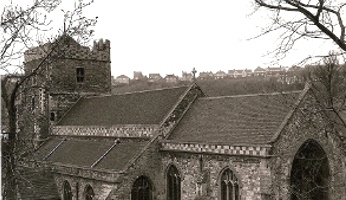 In fact, at All Saints he respected the existing fabric and his work did not extend beyond replacing the panelled tracery in the aisle windows, most roofs and the south porch. The main later alteration was a north vestry and organ chamber by A J Style in 1894 (CDG 4 p62). The organ was placed behind one of the retained windows of the chancel. B C G Shore was responsible for repairs between 1954 and 1958 (ICBS). Brasses: (South aisle) Thomas Goodenough (c1520) and his wife. Small figures with the popping eyes common at the time. 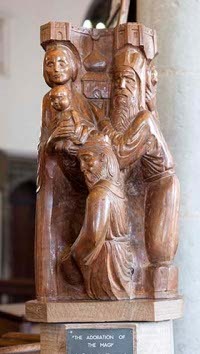 Carving: Adoration of the Magi, undated in yewwood by J Reid (inscription). Chancel fittings: (Pulpit and altar rails) Designed by Butterfield, 1888-89 (Thompson p447). Font: C15 octagonal. On the bowl blank shields in quatrefoils and trefoiled arcading alternate. The stem is also arcaded. 1. 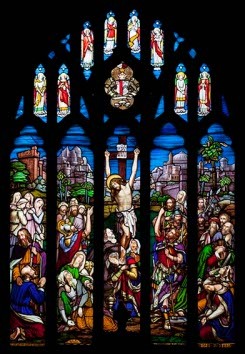 (East window) C A Gibbs, Crucifixion, 1865 (BN 12 p91). This is presumably the glass that Sir George G Scott had in mind when he criticised the east window in his Recollections vehemently, using such terms as ‘mawkish’. It is brightly coloured and pictorial in nature, and by 1865 must have seemed very old-fashioned. 2. (South aisle, east window) H Hughes, 1880 (signed). 3. (South aisle, first and second windows) Lavers and Barraud, 1883 (CDK 1882 Pt 2 p142) (Rev Webster Whistler). 4. 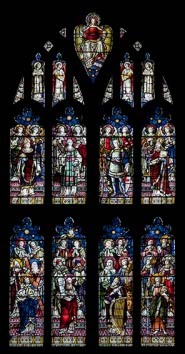 (West window of tower) Heaton and Co (i e Heaton, Butler and Bayne), 1886 (Stubbs/saints) (CDK 1886 pt 2 p146). 5. (North aisle, first and second windows) J Powell and Sons, (G A Foyster/Christ in the Temple), 1897 (CDG 49 p11) and 1912, designed by E Penwarden (Hadley list). 6. (South aisle, west window) Centre light by J Powell and Sons, 1908 (Order book) and side lights by P Cole, 1958 (www.stainedglassrecords.org retrieved on 4/3/2013). This is now largely concealed by a children’s room. 1. 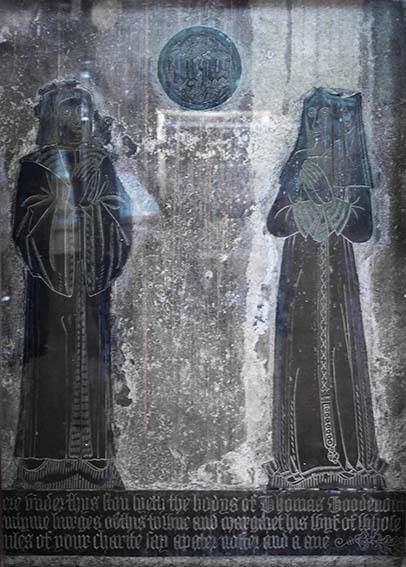 (North aisle) Black marble slab to John atte Clyve, one-time Member of Parliament (Bertram p389), and his wife. It is of Flemish workmanship and the figures are clear, though the inscription is mostly illegible, including the date of death, said to be 1458 (VCH 9 p22). 2. (North aisle) Eliza Beazeley (d1823) signed Winter and Co of Hastings. 3. (South aisle) James Alderson (d1823) signed Winter (clearly the same as the last). 4. (North aisle) Elizabeth Barnouin (d1826) tablet by M Vidler (Roscoe p1314). 5. 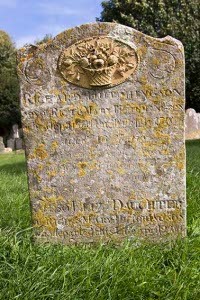 (North aisle) Sarah Thompson (d1826) signed W Vennall of Hastings. The one nearby to Eliza Brown (d1823) is by the same hand, though unsigned. 6. John Edmonds (d1847) by W H Burke and Co (ibid p167). 7. (Churchyard) Lady Harriet Paget (d1855) by E Richardson (ibid p1035). 8. (Churchyard) Tombstone by J Harmer. The terra cotta plaque is unmistakable, but Hastings is unusually far east for Harmer which perhaps explains why it was not recorded by G L Remnant. 1. 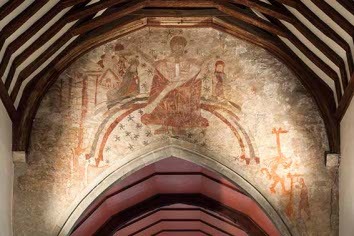 (Over chancel arch) C15 Doom, found in 1870 (2 p292). Christ is seated on a double rainbow with the damned on the right (one is shown being hanged) and the redeemed on the left. The central part is well preserved. 2. (North aisle) Paintings dated to the C16 with rhyming inscriptions were found in 1870, but not preserved (ibid p194). 3. (Chancel east wall decoration) E R Frampton junior, 1907 (CDG 165 p142). This perhaps contradicts the hope expressed in The Architect (see above), but is more subdued than anything by Butterfield. Their setting looks oddly truncated and not all of this may survive. It may belong to a decorative scheme which W H Romayne-Walker is said to have designed at an unknown date (BAL Biog file). 1. (South chancel) C15 trefoil-headed, much restored. 2. 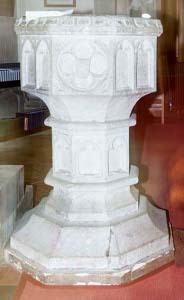 (Reset in south porch) C15 pillar-piscina. Reredos: Butterfield, 1888-89 (Thompson ibid). It was painted by Frampton in 1907 as part of his scheme of decoration (BE(E) p425). 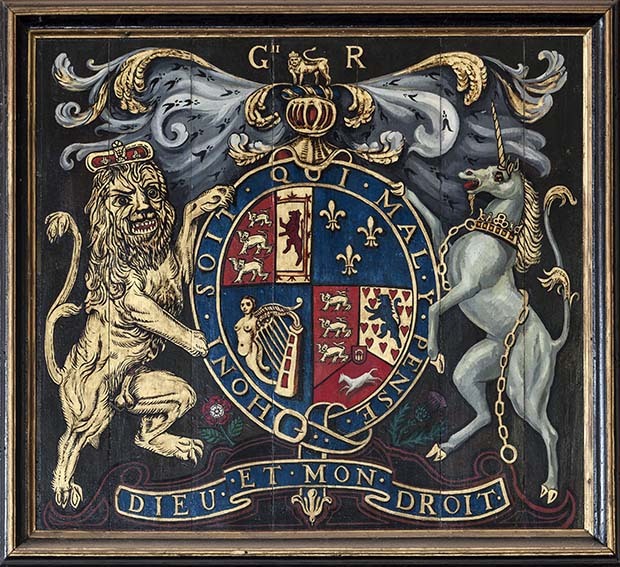 Royal arms: (North aisle) George II. Sedilia: (South chancel) C15 triple with cusped heads and traceried spandrels. 1. My thanks to Josie Campbell for the photograph of the tower. 2. My thanks to Nick Wiseman for all the remaining colour photographs. He also spotted the previously unrecorded Harmer tombstone.